Overcoming objections in sales is your primary goal with every sales conversation. Overcoming objections in sales is critical for you to have success in sales. You’ve heard the word “no” more times than just about anyone in the world (besides people who’ve been in the field longer than you). But what most people don’t realize is that “no” doesn’t always mean they will not or cannot buy from your company. While they may seem like they’re not interested, there is an art to overcoming objections in sales. In the first world, we are bombarded with offers, sales pitches, and ads each and every day. It’s for these reasons that the public (in general) has built up a shield. Just looking/checking things out (aka “kicking the tires”). I’m not sure what we’d use it for. Or just a cold “Not Interested”. Getting past these initial guards is the difference between reps that meet their quotas and those that don’t. Seriously. Let’s say you have about five meaningful calls a day four days a week. 20 calls to either close accounts or set appoints (depending on whether or not you’re a closer or an SDR). If you only get 10% on average, is that enough to satisfy the goal sheet? Probably not. That’s why you’re here, right? Well, let’s take a look at the process of getting around the shields. 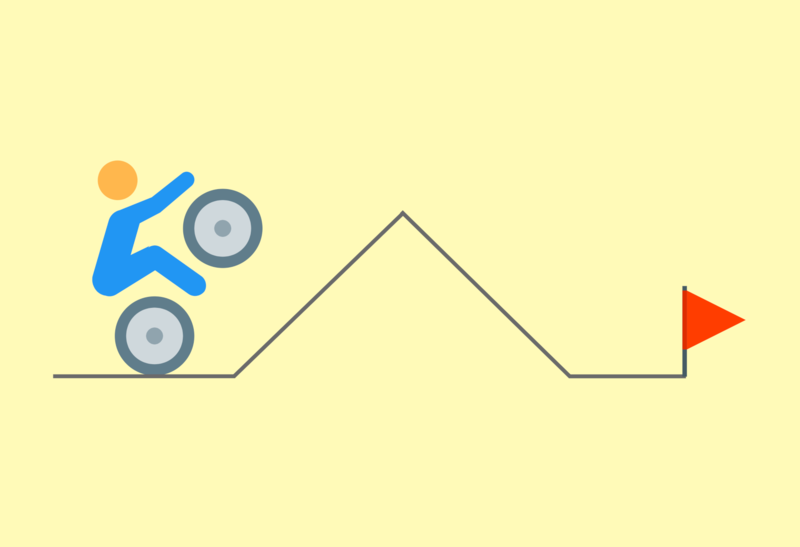 While this isn’t a post about overcoming specific reasons most B2B buyers will use, we do think it’s important to give you a feel of these excuses that you’ll hear if you’re in sales long enough. Keep these in mind when we’re tackling the basic approach for overcoming objections in sales. It’s Too Much Money: Pricing is all over the map, especially in tech/software. Usually, the bigger the pain solved—the bigger the price tag. If you can explain how well your solution alleviates their biggest problem, price is not longer an issue. We’re Happy with Our Current Provider/Solution: Very few products get to invent a totally new market (kinda like Slack). If you’re going to sell, you have to make leads want to switch and that means understanding your competitors’ products as well as your own. The Product is Too Complicated: B2B software is often notoriously complex. They used to call Infusionsoft—confusionsoft. Understanding how your company onboards new accounts will be a critical selling point in this case. Yeah, Just Send Me an Email: A classic hand-off line to get off of the phone. We like cold email outreach here and actually love sending emails that get even the most time-stingy leads to respond with open minds. I’ve Never Heard About You: Startups, am I right? Getting your voice heard isn’t about viral videos or Facebook ads. It’s about sales reps getting people to respond, building rapport quickly, and getting leads to understand the product. Again, there are larger lists that clearly explain how to get past many objections. These are just some of the most common. Like dancing with a partner that doesn’t want to move (at first). In fact, it’s like they’re asleep and as they slowly wake up to the music, you have to convince them to rumba while teaching them the moves. All before finishing together in perfect sync. If someone could actually do that—you’d be impressed, right? Sales people have to do something similar for a living. If you do cold outreach, you’re waking them up to your brand upon contact and, at first, they probably won’t like being disturbed. But the dance has begun. Either they’re going to walk off the floor OR you convince them to start taking rumba lessons. In B2B, there are too many occasions when reps know too little about the brand they are trying to reach. When the decision maker (or direct influencer) is on the line, only basic information is sitting in front of them barely gone over right before the call—that is no way to try and sell a product. One of the easiest ways to cut down on the number and type of objections that you hear is to know as much about a lead as you can before contacting. You can do this with a list of leads bought from a third party, but the best way to understand a lead is by crafting a list yourself (aka prospecting). Doing this can help you know revenue, number of employees, industry specifics, and other things that will help you during the conversations you’ll have. Example: If you know all the brands on your list are in the $3-10 million range and almost have to employ a solution like yours, then you know you won’t hear “we can’t afford it” or “we don’t understand your product”. You’ll be able to hit the ground running and try to differentiate yourself from their current tool. The problem with a lot of pre-determined comebacks to objections is the robot syndrome that can occur on the phone. When you stop listening to understand and start listening to respond, you’re not trying to attract a partner for a business anymore—you’re engaged in sales jiu-jitsu. Both of you will roll around for a while until the other taps out. Oh, and no one buys anything. When you aren’t being genuine, it’s very noticeable. So, just hear what they have to say. Even if you know exactly how HubSpot told you to answer back; give it a minute. You may actually see a different angle and another approach altogether. If nothing else, it may shock the contact that you actually had a conversation with them instead of trying to get to the next call. After you’ve reached a sufficient understanding of the problem, it’s time to show how good of a listener you really are. If you can portray the problem with enough clarity, the lead will be more likely to feel like you understand their industry (often a common cause for objection). If you’ve done step one well enough, you should be ready to go. Now it’s time to start removing, or jumping that barrier. It took this long to actually reference the “objection” itself because of the need to get all of the facts before you engage with the problem that is keeping you from setting the appointment. Every step is overcoming objections in sales. But once you’ve avoided all you can avoid, listened closely, and expressed your understanding—you have to jump that fence. Practice Responses: During your research, mark down which objections you are possibly going to encounter. Spend some time going through your responses and make them specific to the industry that you’ll be targeting. Make sure you don’t sound rehearsed, but know your stuff. Know Your Solution: They likely have a solution already, but don’t understand how yours can make their work life better. Ensure that you carefully weave what you’re selling into the response of the objection itself. The point of the call is to move leads closer to buying (or to buy), not win an argument. Ask to Respond: Before you begin, let them know that you intend to respond. Be bold and ask them if they’d be interested in buying if you could remove their fears and satisfy that objection. Then, go in for the final move. Tackle that objection. 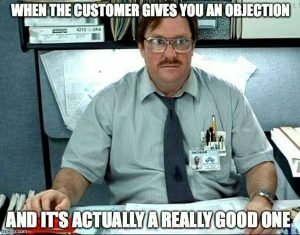 Ensure Understanding: After you show them the reason that their objection doesn’t disqualify them from being a customer, you’ll have to see if they feel the same way. Ask them if they understand in common, natural language. After you’ve attacked the objection and the lead understands, it’s time to move things along. Ask for the sale. If it works—Congrats! You did it. They have other objections and they should come out in the conversation. The lead is really a suspect and shouldn’t have been qualified. You didn’t handle the objection properly. If they have another objection, start over at step two and keep things moving. If they may be a suspect, it might be best to let them go. If you didn’t handle the objection well enough, you’ll probably lose this one. So, immediately after the call, write down everything you can remember about the conversation. It’ll come in handy for future study. Rare Note: Maybe your solution isn’t right for the lead. It’s rare, but sometimes an objection could be legitimate. Don’t use this as an excuse, but there are times when you’d rather lose the sale rather than have an unhappy customer. 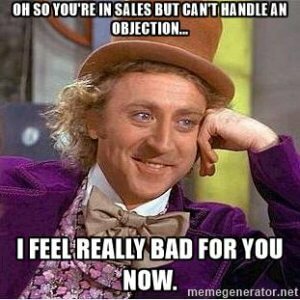 What’s Your Best/Worst Sales Objection Story? How about telling your best sales objection hurdle jump in the comments? Which sales objection really grinds your gears and which ones do you find the easiest to get around? Thanks, Brooke! Value is really what you’re selling. Convincing them that the product is actually what they need, not justifying the cost.